Feather comes to us by Samurai Punk; the same Aussie indie team that give us the endlessly-hilarious Screencheat. 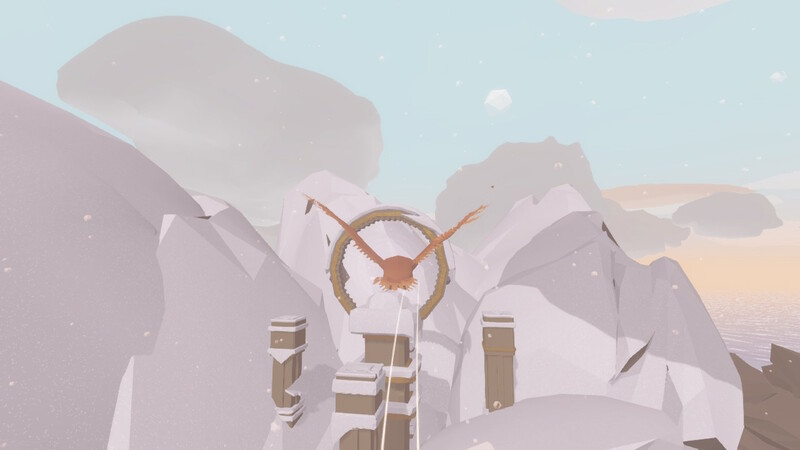 Unlike that all-action party event, Feather is a calm and lighthearted game that focuses on the freedom of exploration available only by flight. Billed as a ‘zen-like,’ the player is in control of a bird… and is free as a bird, allowed to explore a beautiful island at their own pace. In Feather there are no enemies to encounter, no puzzles to unlock or distracting threats. It is simply the player exploring the beautiful low-poly environment whilst listening to a soundtrack filled with ambient, relaxing tracks. And that makes it a breath of fresh air in an industry that is so focused on heavy action and endless combat loops. Players can direct their birds around the environment in numerous ways and perform various exciting maneuvers. The bird can turn left or right, can barrel roll left or right, speed up and slow down or do a somersault to return to the previous direction. There is a soaring sense of movement in flying past trees or through an underground cavern and commanding the bird to barrel roll to avoid obstacles. Unfortunately, once you have mastered flying around the island (either using standard of gyro motion controls) and spent some time exploring the natural environment Feather takes a nosedive, for anyone who prefers to have objectives in their games. There just isn’t enough to do to sustain the game for more than a few hours. It feels amazing to discover new parts of the island but once seen there’s not much to actually do there. Feather could easily have improved longevity by incorporating a simple challenge list to the game. It’s clear why the developers haven’t done this – the goal was to have a no-pressure experiential game, but that doesn’t work if people aren’t playing the game in the first place, and there is just is not enough to offer to keep players wanting to return. Feather does have a light multiplayer mode which it refers to as ‘passive’. If you are connected online, you will be able to see other players birds flying around and follow them and explore together. During my time with the game I was connected for hours in the evening three nights in a row and it was only the second night that I ended up encountering another player. This could be down to the small player base or my unfavourable time zone, but it was still mildly disappointing that a core part of the game – the ability to enjoy a shared experience of the world and joy of flight – is so underpopulated. When you successfully encounter another player, you can interact with them by chirping, which can help you find your new buddy if you get separated or lost from one another. The easiest comparison to make here would be with Journey, which similarly limited interactions, but in doing so, made the shared experience that much more joyful. Feather does boast quite a lovely, piano-based soundtrack, which is serene and relaxing, and one of the most effective elements in selling the “zen” theme. The player has the ability to change music as they cruise around the island by flying through the hoop of a monument. There are quite a few of these scattered around the island and it will not take long until the player finds themselves consistently circling back to one of them in order to change the music to a particular favourite track. Graphically Feather is rather beautiful. The low-poly island environment is breathtaking as it cycles through a day and night cycle. Flying over the island when dawn breaks or flying into the sunset were both wonderful experiences. Some of the areas look almost magical during different times of the cycle and it is worth experiencing each inch of the island during different parts of the day. The only downside is that for some reason or another Feather’s framerate has a habit of stuttering, which is so disappointing given the way it tends to shatter the immersion in the world. Feather is a beautiful, soulful experience, which is sadly too limited for its own good. The environment is beautiful, the soundtrack memorable and the flight mechanism controls well enough that the game itself was wonderful to play for the first hour or so. 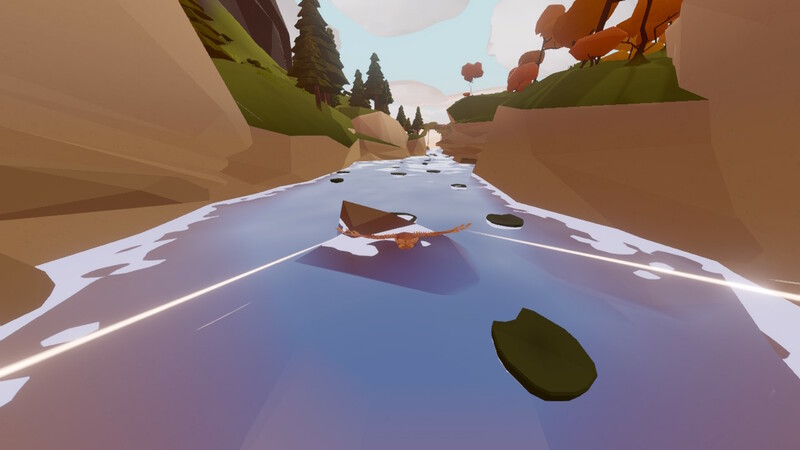 If you are the kind of person that likes their games to have objectives, then Feather is likely to frustrate – even in comparison to other low-stress, generally open exploration experiences – such as Yonder or Proteus – Feather lacks direction. But then Feather is so earnest in its commitment to being a no-pressure, zen-like experience that it’s the video game equivalent of relaxation music… and there’s always some people that will appreciate that.